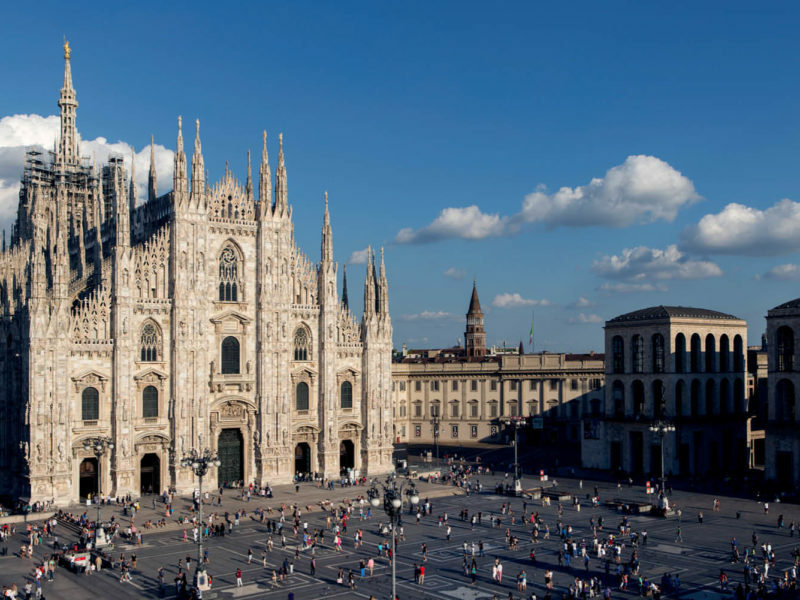 A trip to Milan isn't complete until you've laid eyes on the famed Piazza Duomo. Discover the unforgettable treasures and simple pleasures of Italy’s cultural capital. 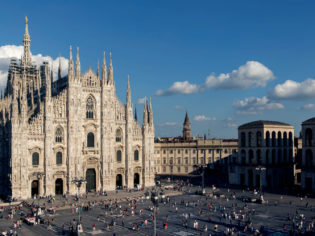 While Rome is the historical heart of Italy and Florence is home to its artistic soul, Milan is the cultural capital where all the good things meet; fashion, food and the arts. Its treasures aren’t as obvious as those of other Italian cities, you have to dig a little deeper to discover them – but that makes them all the more satisfying. If you fancy a designer bag or three, Via Montenapoleone is where it’s at. This narrow street houses all the luxury brands in one handy location. Visit for the window shopping and people watching alone. Galleria Vittorio Emanuele II is also a designer haven and the main street, Corso Vittorio Emanuele II is where to find all the high street brands. La Rinascente is a luxe department store stretching over 10 floors while 10 Corso Como offers a tightly edited mix of designer fashion and art. Think Milan’s version of Paris’ famed, now closed, Colette boutique. For a designer bargain, the top of Via Manzoni towards Archi di Porta Nuova is where you’ll find designer outlet stores such as DMag. Explore the canals of Naviglio Grande. Venice isn’t the only Italian city with canals. A 10-minute metro ride from the centre of Milan to Porta Genova will take you to the Navigli, a set of intersecting canals which were once the city’s main trading routes with Europe. These canals were fed by two different lakes, Maggiore and Como, so the water levels weren’t even. Enter Leonardo da Vinci who designed chiusuras, or dams, so the boats could travel along them. You can take boat rides along the canals or simply spend the day strolling beside them and soak up the charm of the area’s boutiques and bars. At night, it’s a buzzing hub of people taking aperitivo by the water. The boho artists that called Brera home have made their stamp on this little corner of the city and it’s still an art hub. As well as cool independent galleries you’ll find the impressive Brera Art Gallery or the Pinacoteca di Brera, which displays one of the most comprehensive collections of Italian art. There are also chic boutiques, upscale restaurants and picture-perfect cobblestone pedestrian streets such as via Fiori Chiari. His most famous artwork, The Last Supper, is a mural in the Convent of Santa Maria delle Grazie. Seeing it in a book doesn’t do it justice. Stand up close and let the details slowly reveal themselves to you; the folds in the tablecloth, the veins on the hands of the apostles, the use of light to tell the story of good and evil. Book ahead. Numbers are limited to protect the priceless piece and if you turn up on the day, you might miss out. The Pinacoteca Ambrosiana also pays homage to Da Vinci. It’s the caretaker of the Atlantic Codex, over 1000 pages of his notes and sketches. The display, which changes every three months, showcases about 10 pages at a time and can cover anything from his theories on soundwaves and music to the optic nerve and how sight works. His notes are hard to decipher, until you learn that he was a lefty who wrote from right to left in mirror script. It’s an intimate insight into the great man’s mind. The sumptuous red velvet and gilded gold interiors of this iconic opera house are enough to make you swoon, even if you’re not a fan of the theatre. But if you are, it’s worth splurging for a ticket to the opera or ballet. Then there’s the more-affordable behind-the-scenes tours. Experience one of the opera at Milan’s iconic La Scala. Composer Giuseppe Verdi’s operas Otello and Falstaff premiered here and the stage has hosted performances by the greatest opera singers such as Maria Callas and ballet stars including Rudolf Nureyev and Margot Fonteyn. Miuccia Prada is considered the most intellectual woman in fashion and this sprawling contemporary art museum may be a bigger legacy than decades of shaping how we dress. Housed in a former gin distillery, the privately-funded collection is open to the public and is more a cultural compound than regular museum. In addition to the 13,000 square metres of exhibition space, there are cinemas, bars and a new restaurant Torre, which opened in 2018 and has sweeping views over Milan. The Italian tradition of pre-dinner drinks and snacks originated in Milan thanks to the popularity of the bitter liqueur Campari, which was distilled nearby. The idea being that it whets the tastebuds and gets the digestive juices flowing. From about 5pm till 8pm you’ll see people sitting outside enjoying a spritz or negroni with a few nibbles before they head off to dinner. Order a negroni at Officina 12, a hip gin bar in Navigli, head to the top floor of the Rinascente department store and enjoy an aperitivo while overlooking the spires of the Duomo or hang with the locals at Morgan’s, a dive bar in the historic centre just off Via Lanzone. Rovello 18 serves up their own inspired version of risotto Milanese al salto. The city’s most famous dish is the saffron-hued risotto Milanese, served on its own as a primo or with ossobuco as a secondo. For something a little different, try risotto Milanese al salto, where the risotto is cooked then fried so the outer edges of the rice cake crisp up. At Rovello 18, it’s served in little patties while Antica Trattoria della Pesa does a giant disk as big as the plate. You’ll find fabulous seafood at El Brellin and Langosteria if budget permits, or the more accessible Langosteria Café. For a taste of luxury, Italian celebrity chef Carlo Cracco opened Ristorante Cracco inside the historic Galleria Vittorio Emanuele II earlier this year. For something truly dolce, the original Marchesi Pasticceria has been satisfying sweet tooths since 1824. Fancy staying in the same room as composer Giuseppe Verdi, singer Maria Callas or author Ernest Hemingway? They were all famous guests at the five-star Grand Hotel et de Milan and the suites they called home all have a personal touch: from the desk Verdi wrote at to a copy of Hemingway’s visa framed on the wall. This family-owned property is part of the Leading Hotels of the World Group and has an unbeatable location just a block from La Scala and a stone’s throw from the start of the shopping mecca, Via Montenapoleone.